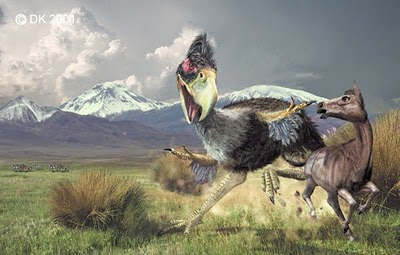 Some time ago we spoke of wallerian Titanis, the second largest bird of the subfamily Phorusrhacidae, or better known as terror birds. It should be noted that in the Subfamily Brontornithinae Terror Birds are heavier and bigger as the bird Brontornis. Phorusrhacidae and Brontornithinae are subfamilies of the family of Phorusrhacids.Anyway, on with the Kelenken. 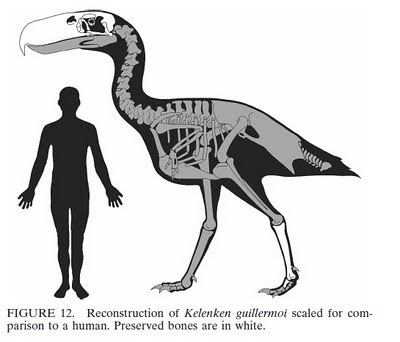 The largest bird is the Kelenken guillermoi. He lived in South America 15 million years ago (Miocene), recall that lived in North America wallerian Titanis for 5. And he could measure up to 2.5 meters tall and weigh about 160 kg elenken was quick and could hunt and devour rodents, reptiles and small mammals. It is the largest known predatory bird in history. And not just any predator was in the top of the food chain, and could face other super-predator of the time. 1 - The size of the head: This came to be more than 70 cm long, with the bird known as the largest skull. Imagine a large ostrich, but with a pointed beak and hook and 7 times larger. All supported by a robust and strong neck. 2 - The second thing that strikes me is the speed: I could outrun an ostrich. The ostrich is known for the speed provided by its two strong legs, reaching up to 65 km / h. The Kelenken guillermoi being young could reach 100 km / h. Come on, that may strike a galloping horse without difficulty. Etiquetas: Kelenken guillermoi., Miocene, prehistoric animals., Terror bird., Wallerian Titanis.